Would Rainn Wilson Do an "Office" Reboot? Rainn Wilson has faced down his fair share of opponents. On The Office it was Jim Halpert (John Krasinski), and now on the big screen in The Meg, it's a, well, giant shark. What if they were combined? 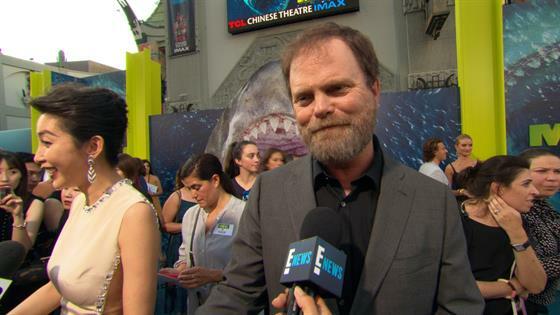 "I would like very much to combine The Office reboot with The Meg," Wilson told E! News at the premiere of The Meg. "Can you picture Stanley, Oscar and Jim getting eaten by a giant, prehistoric shark? I can." News of an Office reboot-revival hybrid—bringing the show back with a mix of old and new cast members—first surfaced in December 2017, but Wilson said he hasn't heard about a potential return to Dunder Miflin. "I would do it if the circumstances were right," Wilson said. Since the news first broke in 2017, several stars of The Office have commented on the potential series return, but official word has been scarce. "I think the idea of an Office revival is—I think it's a great idea. I would be honored to come back in any way that I'm able to. I loved playing that character, and as long as Greg Daniels is the person in charge and the visionary behind it, then I would absolutely be up for it," Jenna Fischer said in January 2018. "We just have to get Mindy [Kaling] to write some episodes, B.J. Novak, Gene Stupnitsky, Lee Eisenberg, Mike Schur. That show was so great because of the talent involved in the show, behind the scenes, not just on the screen." The Meg is now in theaters.